Here's Part 2 of my conversation with psychologist, Sarah Bonner. We focus in on Sarah's research into the experience of black women in the creative industries, it's called "Tapping into Black Magic." Sarah's brings her research to life using words from her research participants. She articulates the issues in a really clear and accessible way and talks about individual differences. The issue for us all is can we recognise what we do when we notice a difference - how does it show up in our behaviour? Sarah's research revealed two overarching themes - empowerment and disempowerment - you can hear more about the themes in this episode and also see them on the poster below. Sarah also talks about two exciting findings which are ripe for further research - 'intragender and intra-racial conflict' and 'the confidence curve'. and look beyond what we expect to see? I mentioned a future guest - Dr Guy Meadows - you can find out more about The Sleep School here. What a guest I've got for you P-Soupers! Meet Sarah Bonner, organisational psychologist. In part 1 - Sarah tells us a bit about her career history, including a major change of direction. She also talks about her current role at Three Minute Mile. 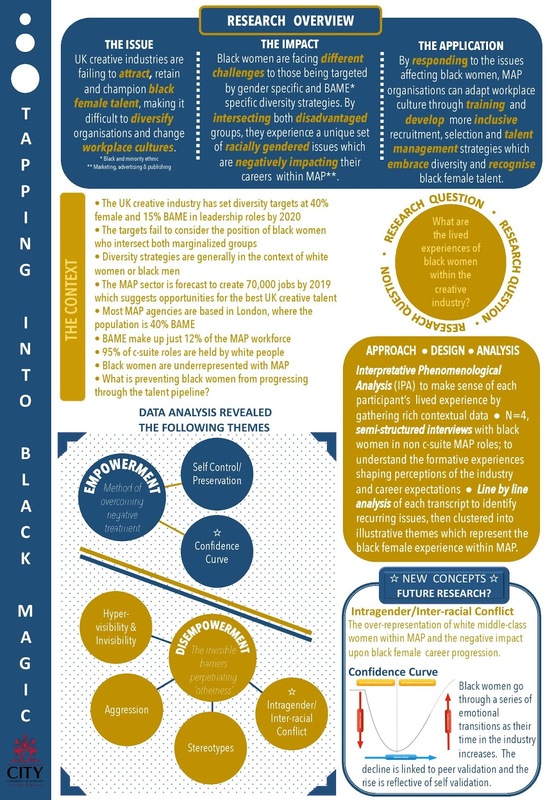 To finish there is a glimpse of Sarah's extraordinary research which explored the experience of black women in the creative industries. You can hear all about the research in the next episode. there's a pain in her chest"
I should have know she would be right - as a dedicated brosette. I always preferred the Bros lyric "I'll watch you crumble like a very old wall." It's a short episode this week - just under 4 minutes. I present a poem that we often finish on in our workplace Acceptance and Commitment Therapy (ACT) training. It's one of my favourites called "Start Close In" by David Whyte. For me, it really speaks to the processes of ACT and my experience of the challenges of taking the first step towards something that matters. Why not have a listen? Here I reflect on the Swedish activist, Greta Thunberg. Greta has taken action on an issue that she cares about deeply. 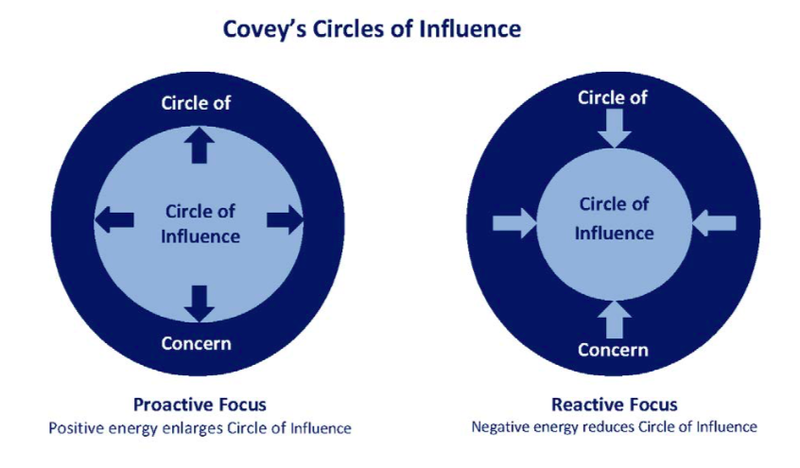 I draw upon the work of Steven Covey to consider how we can take action on issues that we're facing at work. There is definitely always one thing that we can control in our circle of influence - that is - how we show up. Follow Greta Thunberg on Twitter. The episode of the podcast 99% Invisible called A year in the dark. 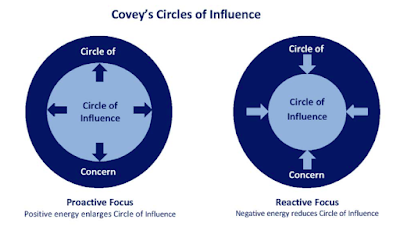 A visual of the circle of concern and the circle of influence. This week, I welcomed our first guest of 2019 - a fellow organisational psychologist & talented researcher, Lauren May. Lauren presents her research on the lived experience of people at work who are also caring for loved ones with dementia. It's a great piece of research and a fascinating insight into the issues. The fact that many people who work also have caring responsibilities needs so much more exposure to enable us all to appreciate different situations and develop appropriate responses. Listening back to this episode - I thought it would be useful to share Brene Brown's wonderful talk on the power of vulnerability. 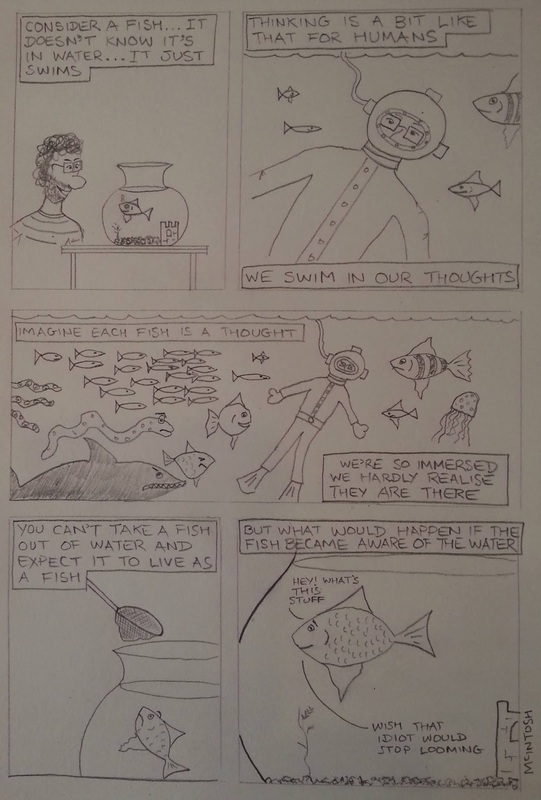 What are we swimming in? 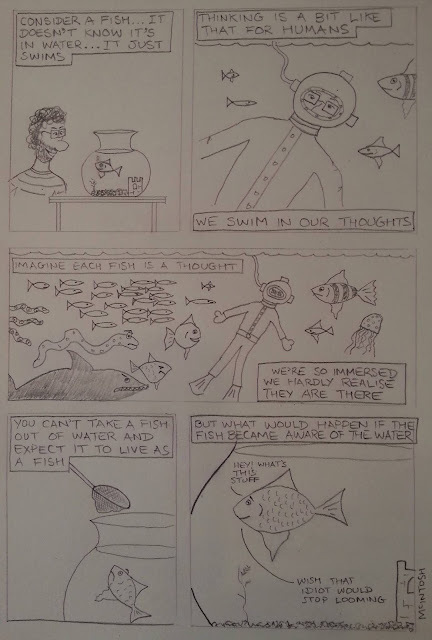 I reflect on my week in relation to a metaphor about fish swimming in water and relate it to us humans swimming in our thoughts. 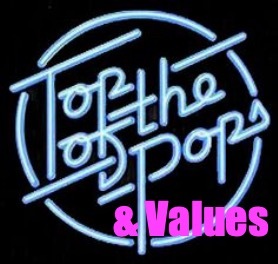 P-Soupers - here I draw upon some classics from the hit parade to share two of my top tips on working with values. It's not always easy and I use these two tips a lot myself so I thought you might find them useful too. 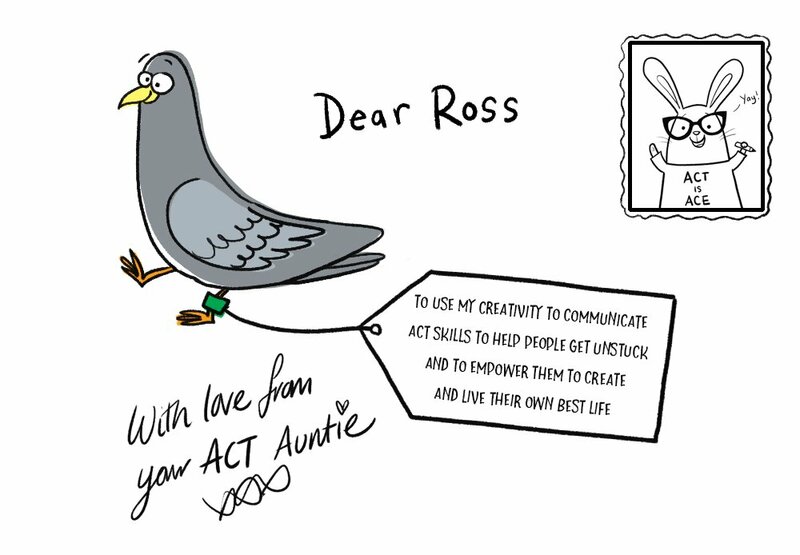 Here's my Pigeon - from My ACT Auntie (and yours!) Thanks Louise. Have a look through this list of values and see if any leap out at you - remember, this is a gut instinct exercise. 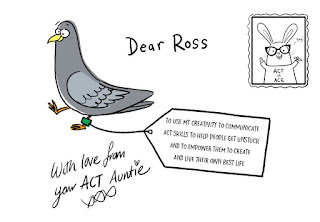 Then have a think about how you could bring that value to life in your behaviour and have a go. You might also notice some of the unhelpful stuff that your mind produces. It's great to notice this as this content can sometimes influence our behaviour without us really noticing. Remember - you can always return to your values - in fact - you should expect many 'gentle returns'. 39. Open-mindedness: to think things through, see things from other’s points of view, and weigh evidence fairly. 40. Patience: to wait calmly for what I want. 41. Persistence: to continue resolutely, despite problems or difficulties. 51. Self-development: to keep growing, advancing or improving in knowledge, skills, character, or life experience.